We are constantly being educated, learning, and getting training for new skills. People with disabilities and the elderly are no exception to this rule. Moreover, they might need additional training and education on how to use assistive technologies and how to cope with the everyday aspects of overcoming their problems. 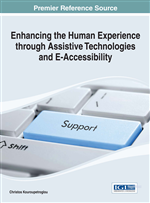 This chapter focuses on education and training and presents technologies, policies, challenges, and opportunities that lie ahead for accessibility in education and training. It presents the different aspects and the different potential solutions based on the level of education trying to cover this need throughout the lifespan of a person. Finally, it finishes by discussing common problems and issues in research for accessible and inclusive education in order to provide useful suggestions and lessons to be had for the future. People are being educated throughout their lives. However, education needs change from time to time depending on the age and needs of the person. A young children in preschool age needs to learn about basic social skills such as how to communicate with others, how behave in a group of people, how to collaborate with them, how to follow orders and instructions, etc. Following that, in the primary school, children learn about reading and writing, basic mathematics and physics, arts, etc. Their knowledge on various subjects is further improved and enriched during secondary school education leading to higher education in universities and colleges where they excelled at knowledge is on a specific subject getting prepared for the job market. Many people think that education stops after graduating the University. However, this is not the case nowadays. People in their jobs need to get training on new technologies and new methods in order to constantly improve their performance. The rapid growth of technology and science generates this cause and needs for education and training almost in all professions. Apart from former education provided through traditional educational systems, people get educated in a variety of other ways for many other reasons. They learn how to get dressed, how to keep their personal hygiene, they take up hobbies, they learn how to cook and generally they constantly need to learn about new students or how to improve already existing ones. In addition to improving our learning everyday life skills, people also need to adapt their skills according to their changing capabilities. Ageing persons for example, might need to change the way they read due to decreasing visual capabilities, or the way they watch the TV due to decreasing hearing capabilities. Moreover, the fact of a sudden disability due to an accident also generates additional educational and training needs. A person who lost his sight needs to learn how to read and write in Braille or how to use his white cane. A person becoming hearing impaired or deaf might need to learn sign language and the person becoming motor disabled will it learn how to use his wheelchair. In addition, every person becoming disabled due to an accident will also need change and adapt his/her behavior and habits according to his/her new needs. The following sections try to exploit potential future ways of teaching, training and educating people with disabilities throughout their lives and according to their period-specific needs. Looking at the overall picture of education we can see three main different roles. The first is the one of the learner, either this is a pupil, student, worker or whatever else. The second is the role of the educator which includes teacher, professors, trainers etc. Finally there is also the role of learners’ sponsors meaning the persons who are interested in learners’ education and training such as parents of children in schools, employers of persons being trained for a job, close relatives or friends taking care of a person’s education etc. Having distinguished these roles we can separate the user needs for education based on them. Communicate and collaborate with educators and peers. Discover, access and use teaching material. Be able to use and participate in assessment procedures for their learning experience. Communicate and collaborate learners and sponsors. Communicate and collaborate with other educators and persons in other professions. Discover, produce, access and use teaching material and information related with various teaching methods. Access and use appropriately information about each learners educational background and needs. Assess learners achievements and needs. Access information about learners assessment and learning experience.